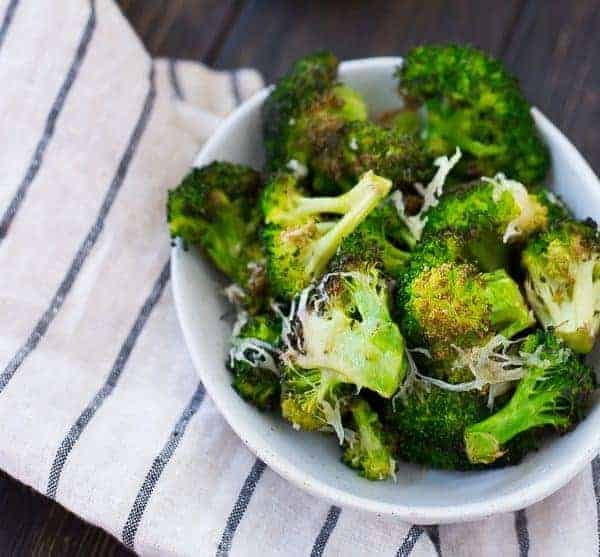 When you bite into crispy Roasted Parmesan Broccoli you’ll feel like you’re eating a treat, not something packed with healthy nutrients! It’s going to become a fast favorite. Ben and I recently binged watched Stranger Things (1 and 2). It’s hard to find a show that we can enjoy together — he’s a History Channel type guy and I’m a Bravo kind of girl. TV is my escape and it’s also typically on while my laptop is open, so nine times out of ten, it’s something I only have to half pay attention to. Ben doesn’t really like fiction books so The Real Housewives franchise is definitely pushing the limits of things he’ll subject himself to. However, we both have been LOVING Stranger Things. I should say we loved it because we’re done now. We don’t have a TV in our bedroom so we’d lie in bed watching it on the iPad. I’d do a little Instagramming here and there but it was mainly just hanging out with each other being scared. Before I go to bed, I typically go upstairs and tuck in the kids, unload the dishwasher, turn down the heat, and turn off all the lights in the house. We live in the country so we don’t have a lot of window treatments which is great during the day, but at the night when it’s pitch-black out and you just watched Stranger Things? Less than ideal. It’s a love-hate relationship and we can’t wait for season 3. Speaking of stranger things, what’s stranger than posting broccoli in the middle of cookie season? I’m not always one to follow trends, so I’m probably not going to start now. I’m just gonna go ahead and direct you over to my cookie archives and then have you come back here and make this broccoli, because green is good. And it’s no secret how much I love roasted vegetables now is it? 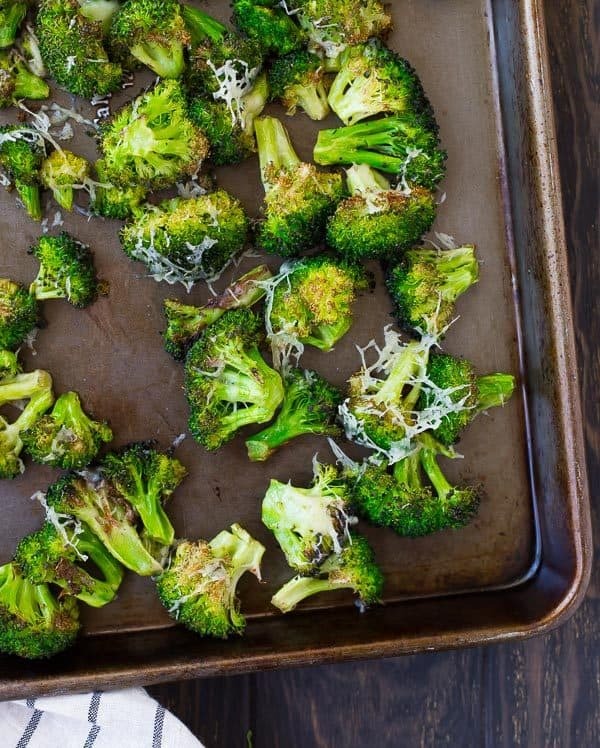 I’ve shown you previously how to roast broccoli and this is a fun and simple little twist on the original method. It’s an easy side dish, whether you’re serving it on a busy night before a Christmas concert or serving it as a pretty green side dish on your holiday table. Tip: The more dry your broccoli is, the crispier it will get! Wet broccoli = steam = soggy broccoli. The goal is NOT steamed broccoli. Dry thoroughly after washing. You can even spin it in a salad spinner! 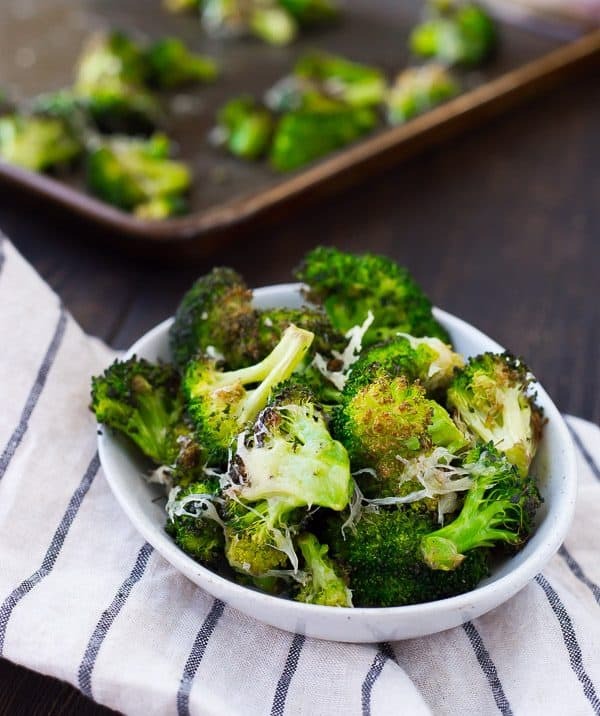 This Parmesan broccoli starts the way most other vegetables are made – clean and dry vegetables, oil, salt, pepper, and high heat. The only difference is that you sprinkle a little Parmesan cheese on at the end to give it the most amazingly nutty salty flavor. Wash and dry. Dry, dry, DRY. Cut into small pieces. Smaller = shorter cook time, crispier broccoli. Roast at 425°F (or 450°F if you’re in a rush). Sprinkle on Parmesan, stick it back in oven to melt. If you love roasted broccoli recipes like we do, make sure to check out Roasted Broccoli and Cheddar Quiche, Baked Chicken Parmesan and Broccoli, Roasted Broccoli Quinoa Salad from Two Peas & Their Pod, or Slow Roasted Broccoli and Cauliflower with Curry from Kalyn’s Kitchen. Cut into medium-sized spears and coat well with olive oil. Spread onto rimmed baking sheet and sprinkle with salt and pepper. Bake for 10 minutes, flip each piece over, and bake for 10 more minutes. 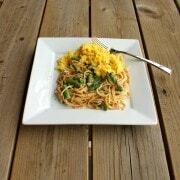 Sprinkle with Parmesan and pop back in the oven or 2 minutes or until cheese melts. 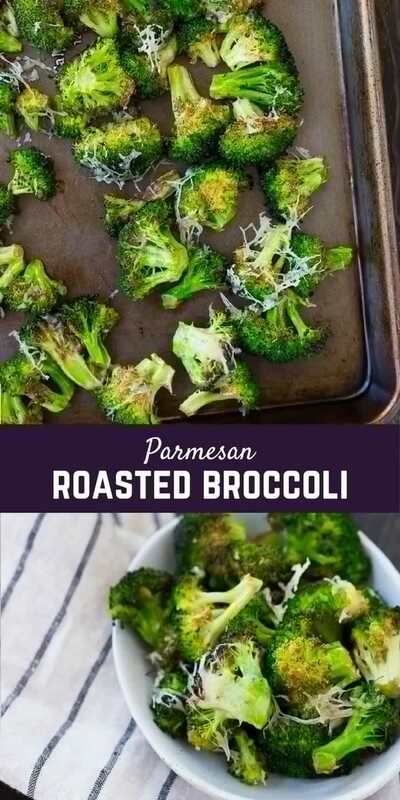 When sprinkling on Parmesan, push all the broccoli to the center of the tray so all the cheese goes on the broccoli instead of the tray! Verdict: I could eat these like candy! 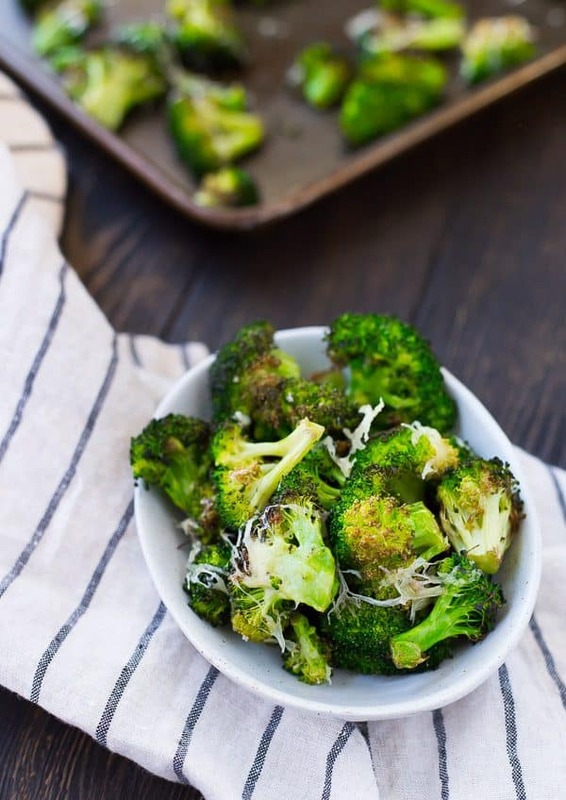 Husband’s take: Ben loves roasted broccoli – it’s one of his favorite vegetable recipes. 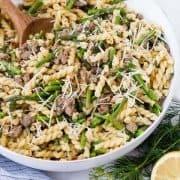 Changes I would make: None are necessary, but if you want to switch it up a little, try sprinkling in some breadcrumbs when you take it out of the oven to stir it halfway through. You could also brighten it up with a squeeze of lemon when it comes out of the oven. Huge roasted broccoli fan here; thanks for the shout-out for my slow roasted broccoli and cauliflower! Tried this recipe tonight. Broccoli was perfectly cooked after the initial 12 minutes. I only did one head of broccoli, so maybe that made the difference. Any longer and it would’ve been charred to a crisp. It was my FAVORITE way to ever eat broccoli! Perfect, easy recipe. Loved it and wouldn’t change a thing. Thank you! I was wondering if you could use Panko instead of bread crumbs? My kids are eager to try this next week! Hi! 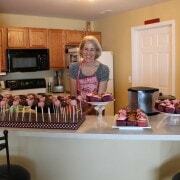 I’m so glad you liked this recipe! I think it would be great with Panko! Let me know if you try it! Thanks for taking the time to comment!